Nowadays life has become painful quite literally, as I am having muscle pain in my hands for about 3 weeks. I went to doctor and he prescribed some medications, as an obedient patient I took the medicine, ended up getting really bad side effects, yes edema, swelling in hands and fingers. Yesterday I called the nurse line and was instructed to keep ice pack to reduce the swelling. The swelling is down a little bit, still my two fingers are swollen; driving car is really difficult still I need to drive so that I can drop my kids to school. Also I need to post for this month’s baking partner challenge. As usual I am late this month too. This month Baking Partner challenge was to make orange blossom water brioche. This recipe is adapted from famous pastry chef Dominique Ansel’s The secret recipes book. Actually I was planning to suggest magic soufflé from the book. Orange blossom water brioche was the base of that recipe and chocolate soufflé is inside. I got excited after seeing the recipe, and also tried magic soufflé, but ended up making chocolate lava. May be the reason for the failure is the absence of pastry rings which chef Dominique Ansel has suggested. When I made chocolate soufflé the lava erupted, and I thought that was the end of the lava eruption. No I was wrong, when covered with brioche dough again lava erupted making the volcano fall in my oven. I was so disappointed that I couldn’t bring myself to try again. May be when I recover from this shock and try to figure out a way out of it, I am going to conquer the magic soufflé for sure. 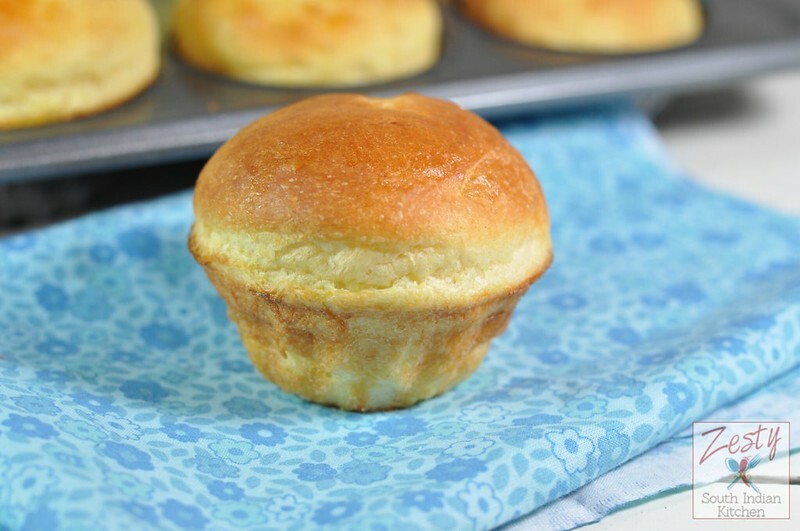 Coming to orange blossom water brioche, brioche, is a pastry of French origin that is similar to a highly enriched bread, and whose high egg and butter content give it a rich and tender crumb. It is “light and slightly puffy, more or less fine, according to the proportion of butter and eggs.” It has a dark, golden, and flaky crust, resulted from egg wash. For this orange blossom water brioche, recipe asked for orange oil, which I don’t have it in my hand, so I used orange extract, you can skip that if you don’t have it. But make sure to add lots of orange zest and orange blossom water. If you don’t have access to orange blossom water, you can use rose water. Then you have to change the name to rose water brioche. Also don’t make adjustment with egg or butter then it won’t be brioche. It is delicious; my kids finished the brioche within a day. I thought I will get some few leftovers to make bread pudding but never got it. May be next time I will increase the amount? It is really easy recipe you need to make the dough day before and bake it next day. You can also use muffin tin or bundt pan to make fun shape. I used mini bundt pan to make it. Give it a try, you will love it. If you want bake with us next month please join us by just shooting an e-mail. Here comes the recipe. 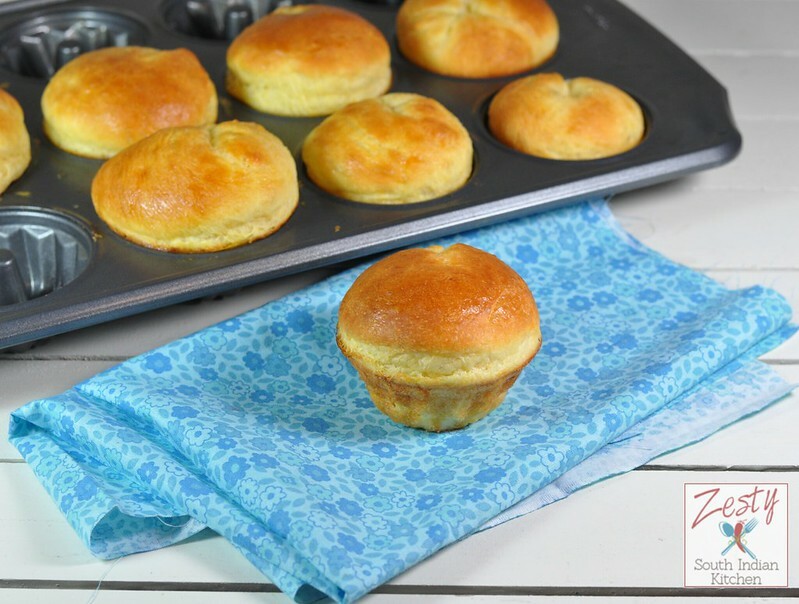 Delicious orange scented brioche rolls great for any breakfast. In a bowl, combine the bread flour, salt, sugar, yeast and eggs and mix well using hand or if using kitchen aid stand mixer use dough hook. Mix everything until combined, knead well so that it develop gluten may be 10 -15 minutes. When it develop gluten the dough will leave the sides and it will pass the window pane test. ( when you pull a piece of dough you can extend the dough without breaking it, also you can make a see through sheet that is called window pane test). Then add cold diced butter, and mix again until all the butter is incorporated well. Then add orange extract, orange zest, orange blossom water and mix until everything is fully incorporated. The finished dough should be smooth, shiny and sticky. Lightly grease a medium bowl and transfer the dough to the bowl. Cover with plastic wrap pressed directly on to the surface of the dough to prevent a skin from forming. Proof the dough at room temperature for doubled in size. It will take about 1 ½ hours. Remove the plastic warp and punch down the dough by folding. Cover the dough again with plastic wrap pressed directly on the surface. Refrigerate overnight to relax the gluten. and shape it into balls/rolls or any shape you want. set aside for 45 minutes or 1 hour until the rolls puffed up well. While the shaped rolls are proofing preheat oven to 400 F/205C. 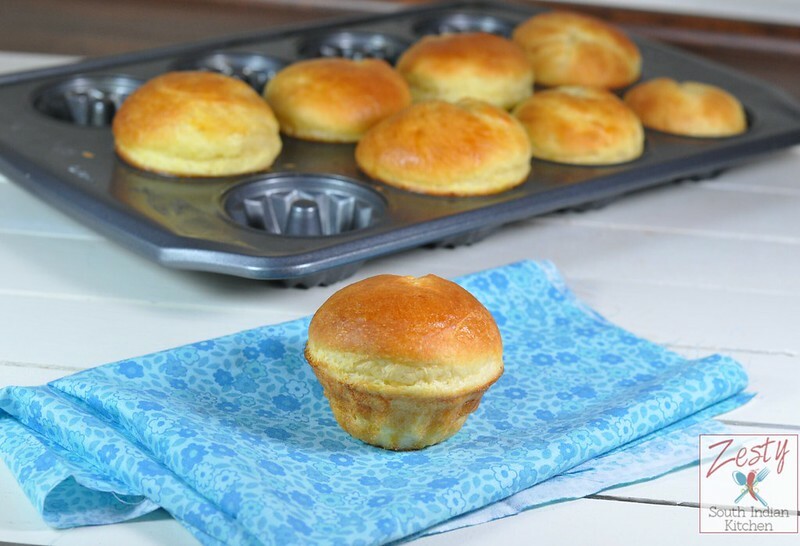 After 1 hour, brush the brioche rolls with egg wash and bake them for 10 minutes or until they become golden brown in color. Leave the brioche for 5 minutes in the pan and carefully remove them and enjoy as much you want. Brush them with little jam or nutella it is so delicious. Wow Swathi!!! I simply loved it…..They look so perfect! just yummy and beautiful orange blossom water brionche.. I couldn’t imagine how much my son like this brioches. He has eaten them with different fillings. Thanks for the recipe. Yours are beautiful. Sure we’ll give them another try. Cheers from a rainy Valencia and in Fallas. So beautifully puffed up, just so tempting.. So beautifully made!! Looks yumm!! Gorgeous brioches Swathi! I bet that orange blossom water imparts a wonderful flavor. So pretty! Beautifully baked brioches Swathi! Take care, hope you feel better! Take care of your self Swathi. I hope you feel better soon. thanks Archana, it is getting better still I have it. Thanks Winnie, Yes I taking it slow now, still I have pain. Must be so good to have the orange fragrance filling up the kitchen and house when the brioche is being made. delicious buns Swathi, take care of your health!!! The brioche looks beautiful and I hope to make it some day. I am planning to add vitamin D also. Now pain is getting less still have it. Despite the pain, you have made amazing brioche. Get well soon. Oh no! I hope you feel better soon! I have never had side effects from medicine. That must be an awful experience. But this looks so good!! Yum! Thanks Cathleen pain is subsiding now. still I have it. Swathi, the orange water brioche look delectable! I like the fun shapes afforded by the bundlette pan. Hopefully the pain and swelling will subside soon. Take care! Thanks Brooks, Yes pain is getting better. Looks good and with a hint of orange..mmmm! The problem with meds is really – side effects :(. Hope you feel better, Swathi! 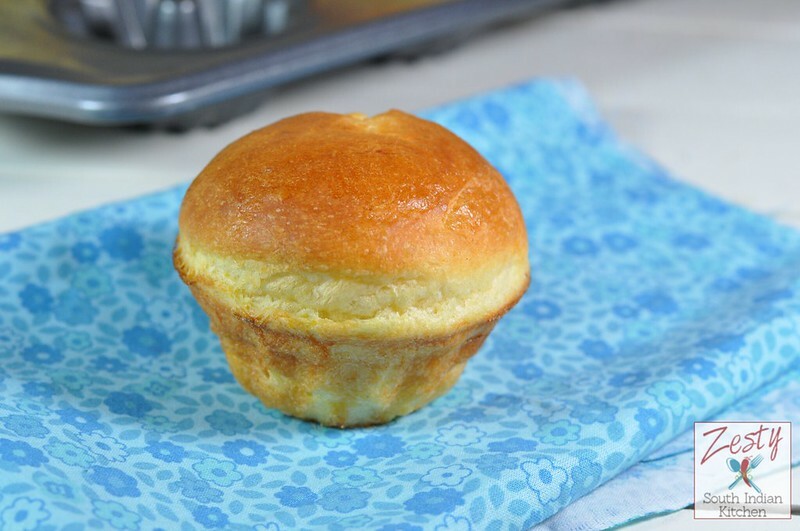 this looks fantastic.. i love the flavors in it..
wow perfect brioche.love the flavor.take care swathi. They look fantastic. I love them! 🙂 I’m a huge fan of orange blossom water actually!